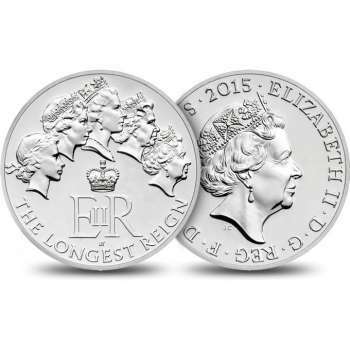 This fine silver £20 coin is designed to be enjoyed time and again; a memento of this once-in-a-lifetime occasion. 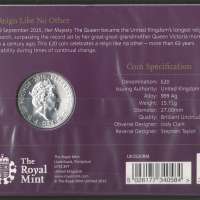 Struck to Brilliant Uncirculated standard, a superior finish to the coins in your pocket, the reverse design features Stephen Taylor’s nostalgic yet contemporary composition. 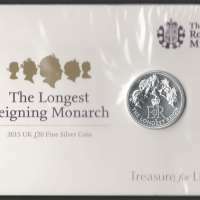 He showcases each of the five definitive portraits of Her Majesty to create a timeline effect, where we see the story unfold of a monarch maturing on the nation’s coins. 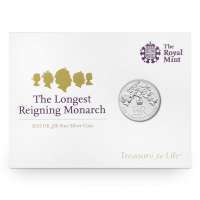 Capture the moment Her Majesty, with her characteristic modesty, became our longest reigning monarch, by adding this magnificent coin to your collection.